The colony of volvox is called coenobium (if the colony having fixed number of cells). It is spherical in shape. Each colony has number of cells from 500 to 50,000. The interior of the colony is filled with mucilage. The colony moves with the collective action of the flagella. The end directed forward is called anterior end. The end directed backward is called posterior end of the colony. All cells of a colony have similar shape and structure. The cells are closely packed. They are arranged to form polygonal shape in the colony. The wall of the mature cells is thick and mucilaginous. Cell wall has thin middle lamella. Their cells are pear shaped. These cells are embedded in the periphery of gelatinous colony. The structure of individual is similar to Chlaymydomonas. Each cell has two flagella. These flaglla are attached at the outer point end of cells. Each cell has cup shaped chloroplast. It is present in the broader end of the cell. One pyrenoid is present in the chloroplast. Two or more contractile vacuoles are present near the point end. Single nucleus is present in centre of the cell. It is connect to the flagella by neuromotor. A single eye spot is present. Cells at the anterior surface of colony have well developed eye spots. New colonies are produced within the parent colonies during asexual reproduction. 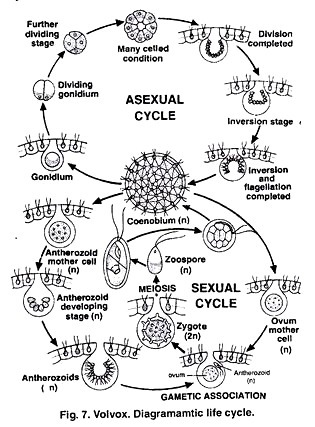 Only certain cells at the posterior end of the colony take part in the asexual reproduction. The size of these cells increases. They become ten times larger. These cells are called gonidia. There are 5 — 20 gonidia in each colony. They produce daughter colony within the parent colony. Sometimes, a pore is produce in the wall of parent colony. Thus daughter colony comes out from parent cells and it become free. In some case, it remains within the parent colony. The parent colony disintegrates and releases the daughter colony. Sexual reproduction is oogamous in volvox. Colony may be homothallic or heterothallic. Asexually produced daughter colonies are absent in sexually producing colonies. The reproductive cells are called gametangia. Gametangia are present in the posterior pole of colony. These cells are larger than the vegetative cells. Gametangia withdraw their flagella. An aperture is produced in the wall of oogonium. Antherozoids enter into oogonium through this pore. Only one antherozoid unites with the egg and zygote is formed. Zygote secretes a thick wall and become oospore. The wall of oospore is three layered. Oospore produces a large amount of heamotochrome. So its colour becomes orange red. The parent body disintegrates and release oospore. Oosphere germinates in favourable conditions. First division is meiosis. Oosphere has three walls: exospore, mesospore and endospore. Exposure and mesospore ruptures. The endospore protrudes out in the form of vesicle. Proplast of oospore migrates into these vesicles. This protoplast develops new colony.